Sorry I didn't clarify, been working too long of days here. Total is $9500 turn key. I am NOT looking for donor cars, if you want this you will have to pay for it. We are already swamped with work for months on end here, and have been for the last 3+ years. If no one ponies up in the next 3 months, then I might be willing to do JUST the ecu, as I already have previous out of the country customer who is purchasing an S2 Rx-8 with the entire turbo/ecu package from us. Wouldnt be the Adaptronics by any chance? Thanks for the clarification. How does this work with someone like me that's at the other end of the country? Would you just send instructions for my tuner to follow, or will you require the car be taken to you somehow? These threads are exciting, but also frustrating. We have all watched in hope for something to come from some other prospective options to no avail. 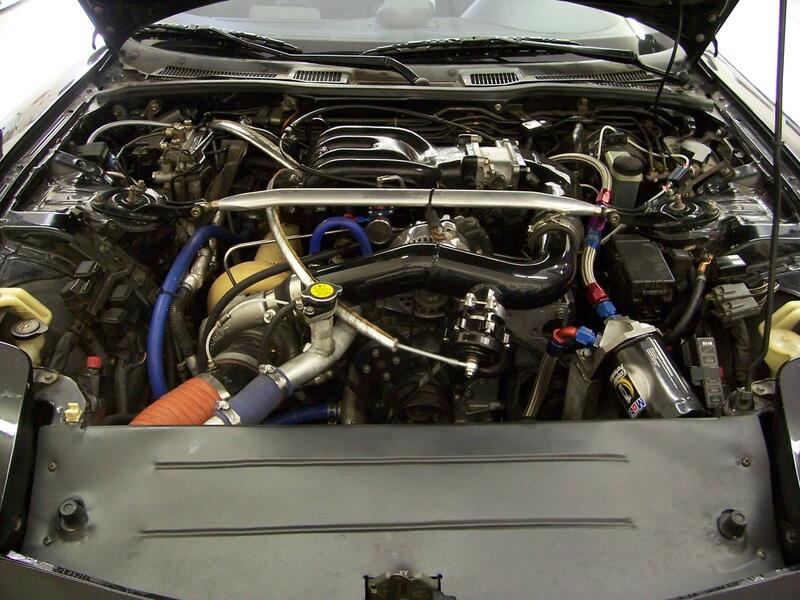 it has been said that this ECU manufacturer (whomever it is) actually has this up and running with a greddy kit--on a S2? I guess I'd feel better to see this actually functioining on a S2 before I get too pumped. Stick to finishing up the original version / prototype for us that are Impatiently waiting for you to get with it. Let me know when you are ready to beta it. Me thinks it's the Adaptronics 440 unit. So is there a S2 RX8 Running with Turblown kit ? Im planning to buy one since there is no proper SC kit. And off topic does the kit works with oem rotors and housings ? And what RPM does full boost coming on which Bar ? We have not installed or sold a kit to an S2 owner yet. 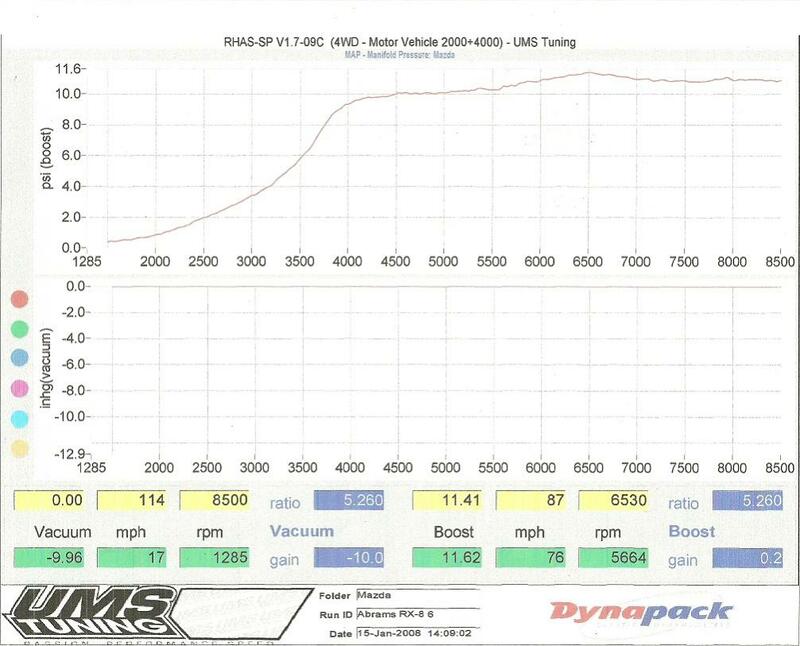 Here is the boost curve on a 1.06 T3 GT35R with a bone stock untouched engine with 60,000 miles..
As you can see its in boost right from 1500rpms on, but won't reach full boost til 4000rpms. This can be adjusted by going with a smaller turbine a/r, or smaller compressor wheel. A better condition engine will also " spool " faster.. I've used meth injection a few times on the Rx-8s, would like to revisit it now that I've learned a lot more. I've got many many years logged with it on Rx-7s, from non-intercooler cars all the way up to 29psi on 91 octane( lasted 30,000 miles BTW).. I wanna see the dyno sheet from that! Last edited by Ogulcan; 12-07-2011 at 03:26 PM. Updates? Any one become the first guinea pig yet? Last edited by ASH8; 01-08-2012 at 04:01 AM. This thread is "closed" until there is an S2 which has an installation. Discussion and specs about S1 should be in that forum. Last edited by ASH8; 12-30-2011 at 02:21 AM. Are you happy with your aftermarket parts? Greddy turbo kit for S2 possibility?